Roast the cauliflower, Spray a baking sheet with oil, pace the cauliflower florets in a single layer, and spray the tops with oil. Roast in a 350-degree oven for 30 minutes or until the cauliflower is quite tender and browning. Roast the asparagus. Toss first with some salt and pepper, spray a baking sheet, and spread the asparagus in a single layer on the sheet. Roast in a preheated 350-degree oven for 12-15 minutes until the asparagus is tender but has a good bite. Set aside. Cook pasta per package directions until al dente. While the pasta is cooking, heat the oil and add the mushrooms with some salt and pepper. Saute, stirring frequently, until the mushrooms start to caramelize and soften. Add the edamame. Stir well and cook for a couple of minutes or until the edamame are warmed through. Make the cauliflower-cashew sauce by placing the roasted cauliflower in a blender along with the toasted cashews, chipotle chili and adobo sauce, basil leaves, almond milk and lemon juice in a blender. Blend until very smooth. Add salt to taste. 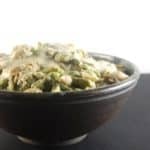 In a large bowl, mix the mushroom-edamame mixture, the pasta, the asparagus and the cauliflower sauce. Garnish with some parsley, if desired, and serve immediately.